FORT MYERS, Fla. — They look like typical restaurant knickknacks. Sea creatures, beach chairs, and even a fold-out picnic table line the ceilings and walls of The Sanibel Fish House. But they’re not exactly what they seem. “It’s made of acoustic foam, all of it is,” said Barry Greenfield, a spokesman for the restaurant. They were installed to make the place less noisy. Restaurants throughout Southwest Florida have similar problems. Noise, an incredible and sometimes deafening amount of it, is pouring into booths and tables at area eateries of all stripes..
A recent lunch at Ford’s Garage in downtown Fort Myers logged a decibel reading of 93.4, which is somewhere between tractor and gas mower according to dangerousdecibels.com. A dinner at Zen Asian BBQ in North Naples on Saturday briefly spiked to more than 102 decibels, just shy of chainsaw-leaf-blower territory. Even Mel’s Diner in Fort Myers reached a max decibel reading of 83.4 during a weekend brunch, about the same as busy city traffic. Such levels aren’t just annoying, they can be dangerous. The Centers for Disease Control and Prevention recommends less than eight hours of sustained exposure to noise louder than 85 decibels, and no more than 15 minutes of exposure to noise louder than 100 decibels. "You’re looking at potential for hearing impairment," said Mark Martina of Martina Audiology and Hearing in south Fort Myers, "certainly if those higher decibel ranges are sustained." Martina said dining noise is among the chief complaints of his hearing-impaired patients. "Trying to make out conversation in an already-loud dining room can be impossible," he said. "I hear all the time how noisy restaurants have become." This dining din seems to be the product of recent trends in restaurant design. Gone are the noise-absorbent carpeting and heavy drapes of the 1980s. In their places: hardwood and tile floors, and massive glass windows to let in light. Open kitchens, where you can see the cooks at work — and hear every steak sear, every pan crash — aren’t helping things, either. “All of those hard surfaces are a problem for noise cancellation,” said Corey Easterbrook of Hot House Music & Productions. Last summer Easterbrook helped Bob Boye, chef-owner of Cru in south Fort Myers, dampen and contain the noise in the restaurant’s bar. Rectangles of acoustic foam now dangle from Cru’s ceilings, with more foam affixed to the walls to help create angles that soak up sound instead of reflecting it. Boye said he spent less than $500 on soundproofing materials, and the results have been worth it. “We came in and measured decibels before and after, and it was a noticeable difference,” Boye said. Easterbrook said parallel walls and the trend toward large, open-format dining rooms crank up the volume at restaurants. But some of the most peaceful restaurants he’s been to aren’t spending big bucks on sound design, they’ve just lucked into well-angled spaces that are, naturally, quiet. 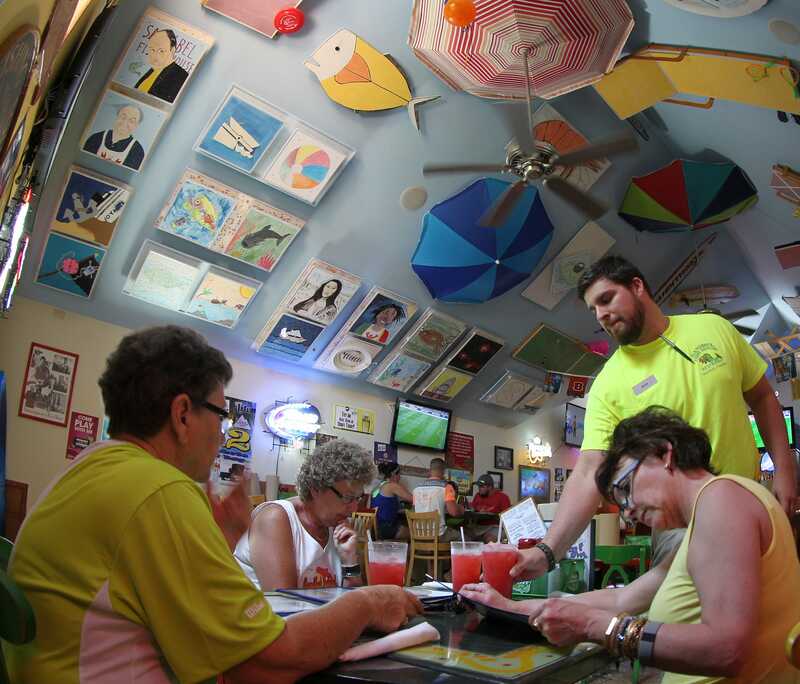 Take The Fish House’s location on Fort Myers Beach. There Greenfield has no need for faux acoustic-foam beach chairs and umbrellas filled with insulation. “That’s pretty much an all drywall and concrete building, and yet we’ve never had a problem with noise,” Greenfield laughed, admitting he was no sound expert.